Unless companies press the pedal on implementation, further stock price gains might be limited, says Hamsini Karthik. The bull run for road construction stocks began in 2013 in anticipation of the Bharatiya Janata Party being voted to power at the Centre. It gathered momentum when Narendra Modi took office as prime minister. Between 2013 and 2014, most stocks of road construction entities had doubled or even trebled. The party didn't last too long, starting to fade away in early 2015. Over a year, NCC has risen by only three to four per cent, while returns have slipped into a negative zone for Sadbhav Engineering, Ashoka Buildcon, J Kumar Infrastructure and IRB Infrastructure. The few exceptions include ITD Cementation and IL & FS Transportation, which have returned 21 per cent and 10 per cent. Clearly, the hope rally has faded away and it's time for companies to step on the pedal as far as execution is concerned. It's time the National Highways Authority of India and the ministry of road transport and highways steps up infrastructure spending. In order words, unless the Street sees clear signs of strong earnings growth and order inflow sustainability, the stock price of road contractors are unlikely to deliver the earlier gains. Earnings, in particular, assume high importance. In the past two years, revenue growth for some of the established companies such NCC, Ashoka, J Kumar and IRB Infra have been staggered and in single digits (eight to nine per cent in FY14-16). Revenue growth of Ahluwalia Construction and Simplex Infra has been flat. This, in turn, has affected the operating profit margins, volatile in recent times. Interest cost is another burden. While interest rates have recently fallen, companies are yet to see substantial relief. PNC Infratech, Ashoka Buildcon and Sadbhav Engineering have seen a 24-50 per cent compounded annual increase in interest expenses over FY14-16. Profit growth has been impacted. "Only a few companies with strong balance sheets would be able to achieve timely financial closure," he adds. Adhidev Chatthopadyay of Emkay Global Financial says the ability of companies to steer through smooth execution is getting restricted, due to project financial closures not happening in the stipulated time. The sector is also faced with a fragmented order tending practice. As orders become more fragmented and there are more bidders at very competitive pricing, the profit margin gets hit. This is reflected in the current financials. In the coming years, say experts, the margins might take a beating if the issue of highly competitive bids is not addressed. "With competitive intensity being high, order inflow share for market leaders is bound to take a hit. This is also why earnings predictability is becoming uncertain," Bhasin adds. Experts say that, in recent years, road construction has become among the most unpredictable of businesses, in terms of capital raising or project implementation. In this context, they strongly recommend investors to stay with debt-free companies. Stay away from lesser-known entities, with no strong record of project execution and corporate governance is another bit of advice. "While the infrastructure theme could be enticing, given the big budgetary push, unless investors are selective, they could end up burning their fingers," a fund manager cautions. For now, experts say, investors with a three to five-year horizon could consider stocks such as KNR Construction, IRB Infra, NCC, Ahluwalia Construction and ITD Cementation. 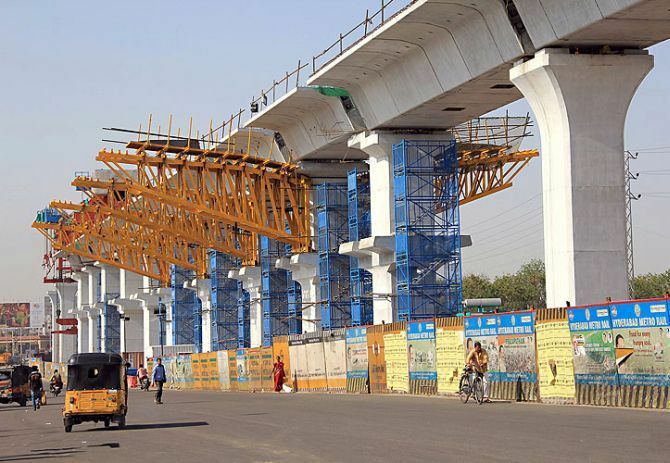 Photograph: Courtesy L&T Metro Rail. A nation of tax avoiders?